As a guinea pig lover I've been gifted my fair share of plush piggies (I must get around to taking a group picture of my collection sometime). 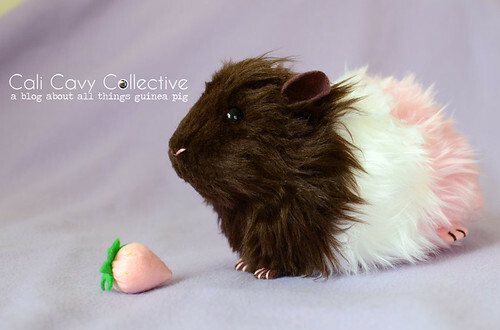 This tricolor Neapolitan, complete with a matching felt strawberry, was a recent gift from the piggy dad. Morumoto - which is Japanese for "guinea pig" - is known for her handmade small animal plushies. The stitched paws and all-too-familiar expressions make her creations too cute to resist. I've long admired the custom commissions that people request to be made in their pig's likeness. Who wouldn't want to have a personalized stuffed animal of their wheeker? Alas, being unable to decide on only one of my pigs, I've never ordered one. Nonetheless, the premades in Morumoto's Etsy are fun to browse through. Have you ever ordered a custom plushie?